The New South Wales Government is looking to the latest in smartphone technology to help victims of domestic abuse. Working in conjunction with police and domestic violence experts, the Government has developed a world-first app that it says will save lives. 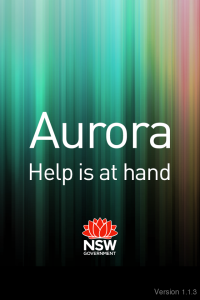 Called Aurora, the free app allows victims of domestic violence to quickly send an emergency message to a trusted friend or police for help. NSW Minister for Women Pru Goward says the app is fast and discreet, and sends a message containing the user’s exact GPS location. “That can all be done with four presses of their smartphone,” she said. The Aurora domestic violence app has a “message friends” section allowing users to quickly send an SMS to a trusted friend or family member when they are feeling threatened. It has a choice of three in-built messages – “call me”, “come and pick me up” and “call the police for me” – that can be instantly communicated in emergencies with three quick touches on a phone pad. The app also allows users to customise texts to include a secret codeword shared only with a trusted friend or relative. NSW Police Assistant Commissioner Mark Murdoch said the app had GPS-locating so police would know where the call was coming from. “Given the prevalence of domestic violence within our community, particularly in NSW, this is an initiative that we strongly support,” Mr Murdoch said. The NSW Domestic Violence Line received more than 22,000 calls from people seeking support in 2011/12. An estimated 10 million Australians own smartphones.